Free bus service throughout Corvallis! Nine routes serve the OSU campus, Mon-Sat. Free late night bus service Thurs-Sat during school terms. All routes serve the campus. Transit service from Philomath to Corvallis, M-F. Free with OSU ID. Bus service from downtown Corvallis to Adair Village, Mon-Fri. Bus service between OSU, Linn Benton Community College, and the Albany train station. Free with OSU ID. New in 2017! Bus service Thurs – Mon from OSU to the Albany Amtrak Station, coordinated with the Amtrak schedule. A Greyhound bus station in downtown Corvallis provides service throughout Oregon and beyond. Direct bus service from the Albany train station to Eugene, Portland, and Seattle. Service 7 days/wk between the Albany train station and Newport, with stops in Corvallis. Train and bus service from Albany to Eugene, Portland, Seattle, and Vancouver, BC. Transit service between Sweet Home and Albany with stops in Lebanon. Free with OSU ID. Private shuttle service from Reser Stadium to the Portland airport. Runs 24 hrs a day, 7 days a week. Private shuttle service from Native American Longhouse to the Portland airport. Runs 24 hrs a day, 7 days a week. Private shuttle service from Corvallis to the Eugene Airport. Picks up from a location of your choice. 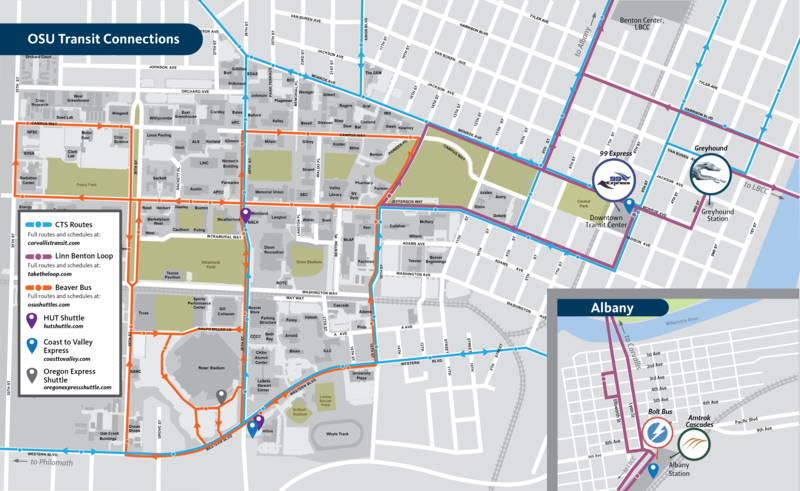 See all the transit routes and stations on campus on one map.